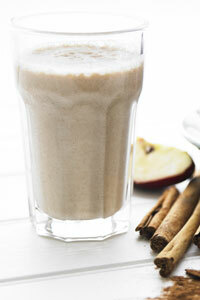 Apple and cinnamon make up one of our favourite flavour combos. Enjoy it in a moreish smoothie form with this simple recipe using Yeo Valley Yeogurt to give it a creamy thick twist- enjoy! 1. Place the apples, juice and cinnamon in a blender and process until smooth (a KitchenAid Artisan Blender would be perfect). 2. Add the Yeogurt and blend until creamy. Serve immediately.